It is still raining. We have been driving for nearly six hours on dirt roads. We’ve had to turn around twice because our driver was going in the wrong direction. I have no clue where we are going. All I know is that it had been raining for two days, and Tess and I are entirely at the mercy of our driver. We cross over mountain passes and take a few more wrong turns. 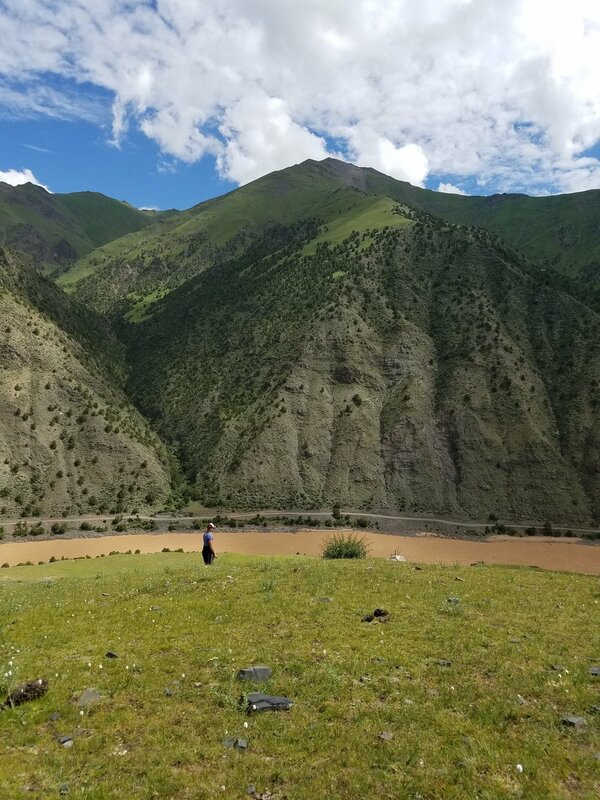 Our driver stops to ask the nomadic yak-herders some questions, and then carries along the dirt road. Eventually we dead end at a massive river with a rickety bridge spanning across. Even up here near the headwaters, the river is 4-5 times the size of the Colorado River through Grand Canyon. Downstream the Yangtze is the largest river in China. It is used to transport goods from the port in Shanghai throughout much of the Sichuan province. It also houses the world’s largest dam, the Three Gorges Dam. Three Gorges was a controversial feat of engineering completed in 2003. As the reservoir filled behind the dam it drowned a river, millions of homes and thousands of years of human history. But all the way up here in the plateau the Yangtze still feels free. It is rushing, chaotic, screaming eastward with a mission to get to the East China Sea as quickly as possible, completely unaware of its stagnant fate that lies downstream. We unload and inflate our 10’ paddle boat we have affectionately dubbed “the tater tot” and begin to rig. Within fifteen minutes our boat is loaded and we are in our drysuits, ready to push off. Our driver looks at us as if we might change our minds. We pay him, thank him, and send him on his way. He is hesitant and drives a few hundred feet away before he stops again. He is not going to leave us behind. 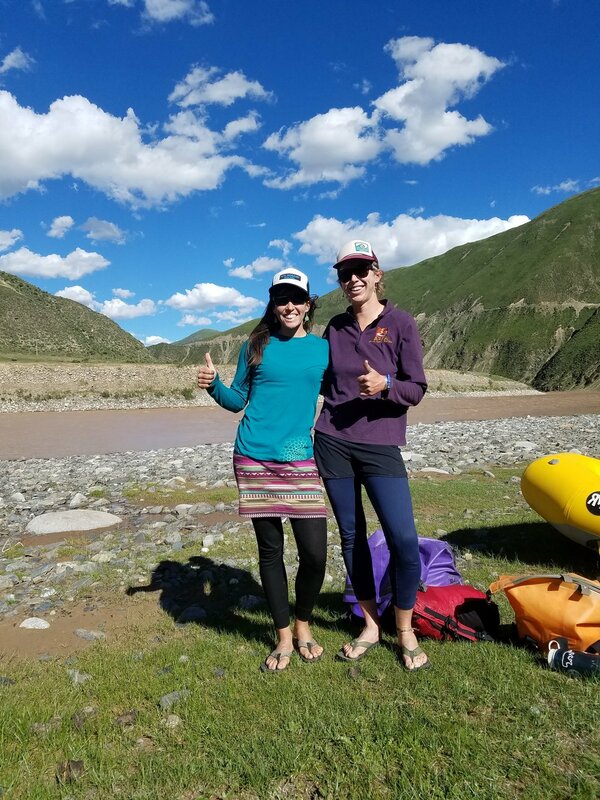 With adventure and adrenaline streaming through our veins Tess and I hop on the tater tot and push off, heading downstream at the mercy of the Upper Yangtze. The first few miles Tess and I get the hang of R2-ing the small paddle raft on this giant river. There have not been any rapids and we practice moving the raft from one side of the river to the other. We turn and ferry. Our little boat is responsive, but it takes a long time to cross the muddy river. I feel like a cork at the mercy of the water. Supposedly there are not many rapids, and they are not technically challenging. However waves on a river this big will dwarf us in our small 10 ft raft. We talk about our plan for the rapids, and with a lot of discussion and thought, decide it is best to clip our quick releases to our raft. Every instinct I have from my years rafting and kayaking is to not be attached to your boat. But Tess and I knew in the best case scenario it could take miles to get back to our raft if we got separated. These were not ordinary circumstances and this was not an ordinary river. All we knew was that without our raft, we might not make it out. Even with one person still on the boat, an R-1 rescue would be slow in such a high volume river. Hesitantly we clip in at the sound of the rumbling water. As we turn the corner the line is straightforward, the major features easily avoidable. We paddle steadily, taking deep breaths. The river continues on like this all afternoon. We spend the next few days exploring the steep ridge lines and clear streams and side-canyons of the Upper Yangtze. The landscape is as though the greenery of Ireland met the mountain ranges of Alaska which then plunged into a canyon reminiscent of the Inner Granite Gorge in the Grand Canyon. 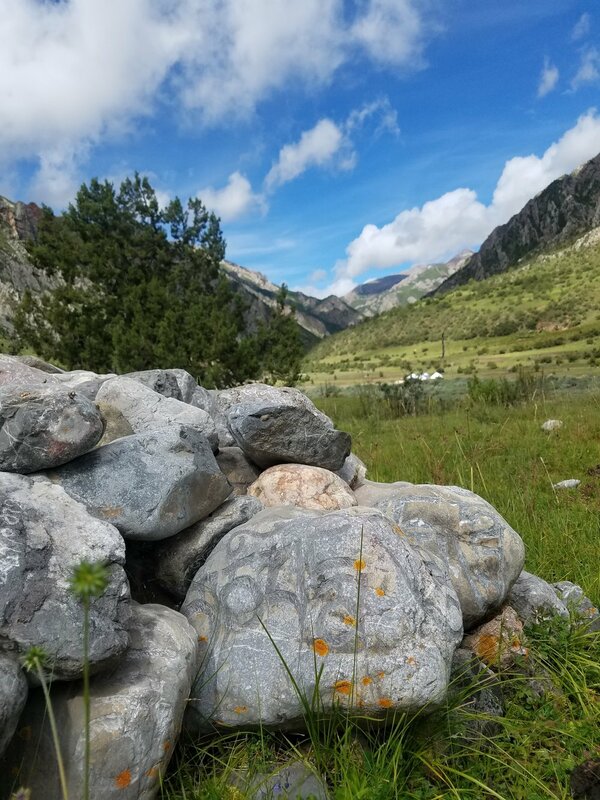 The mountains do not seem so large, until you realize that the pebbles scattering the hillside are actually 4,000 lb yaks. At 13,000 ft, they call the Tibetan Plateau the Rooftop of the World. The mountains are some of the highest in the world, and the landscape one of the harshest. Recent studies indicate that humans have lived in this area for over 60,000 years. Their livelihood and religion is intricately connected to the landscape. 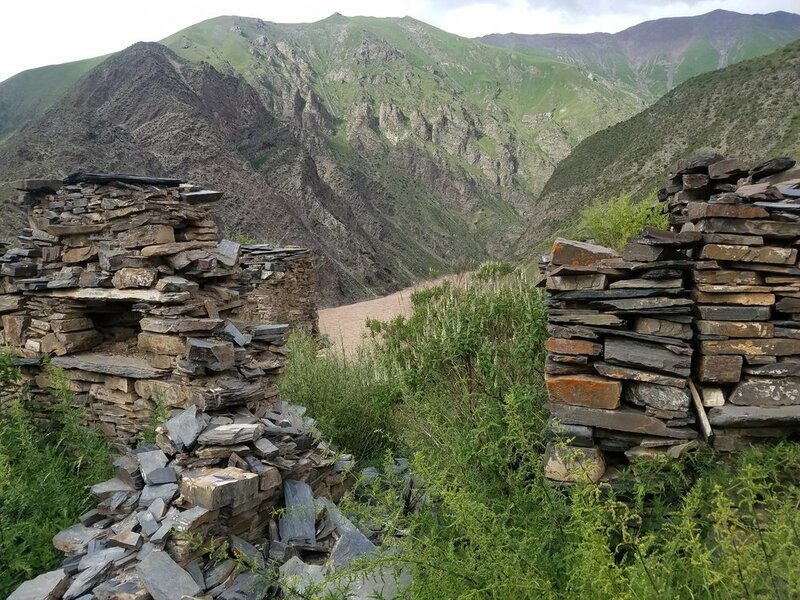 We float past prayer flags and mani carvings in what seems like uninhabited river canyon, and I remember that we are far from alone. We float past two monasteries and each time people rush down to the river to see what we are doing. They ask where we were from, and seemed surprised when we say we are American. Through some rudimentary sign language they ask if we paddled down here. Then they ask if we have flipped. They seem relieved, and maybe slightly disappointed when we say no. The second-to-last morning we raft through a few miles of flat water before we hear the unmistakable roar of a rapid. 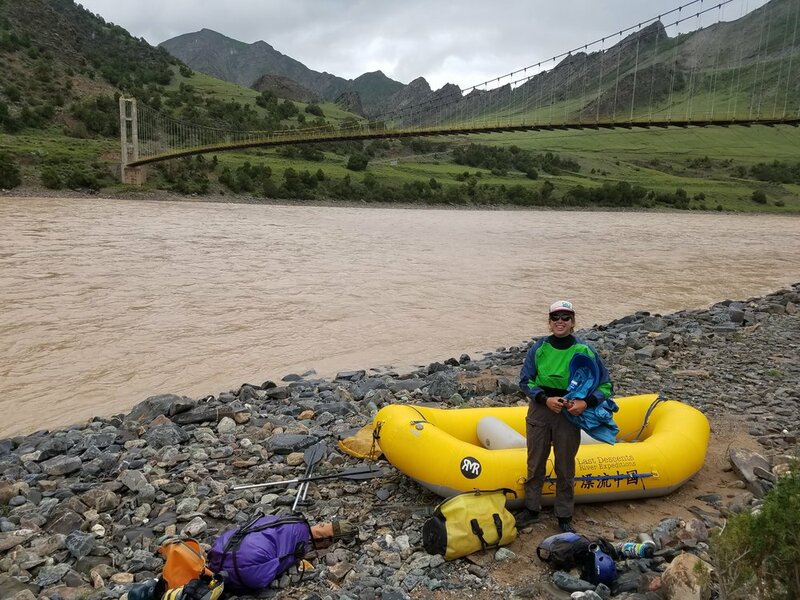 We catch an eddy on the side of the river, close up our bags and clip our quick-release lines to the boat. As we enter we realize there is no avoiding this one. I start bellowing turns as Tess and I dig our paddles into the muddy water. It was a pretty straightforward line, just avoid the holes and paddle for your life in the waves. It is the most exhilarating feeling to crest waves 2-3 times the size of your boat…not knowing if you have enough momentum to make it over top. Below the first rapid we had a few minutes to hug, breathe and take our adrenaline down a notch before we saw the next one. These rapids were not that difficult, but regardless of the moves that we had to make, we had no choice but to gut waves that were over 20 feet. Sometimes, no matter how spot on your line is, waves that big just flip you. We hit the waves straight on, paddled as though our lives depended on it, and were lucky. We made it upright through the second rapid. That was all the whitewater we had that day, and Tess and I breathed a huge sigh of relief as we rounded each corner and were able to stay far away from the holes and waves. I love big waves, but this was survival boating. Just as the sun is about to set below the ridgeline, we find a nice grassy outcropping to make camp. Prayer flags stretch across the river, but we don’t see any other sign of civilization. I set up the mega-mid while Tess starts the hot water for our ramen dinner and hot drinks. 4 days of a remote Chinese river behind us. Take-out ahead. 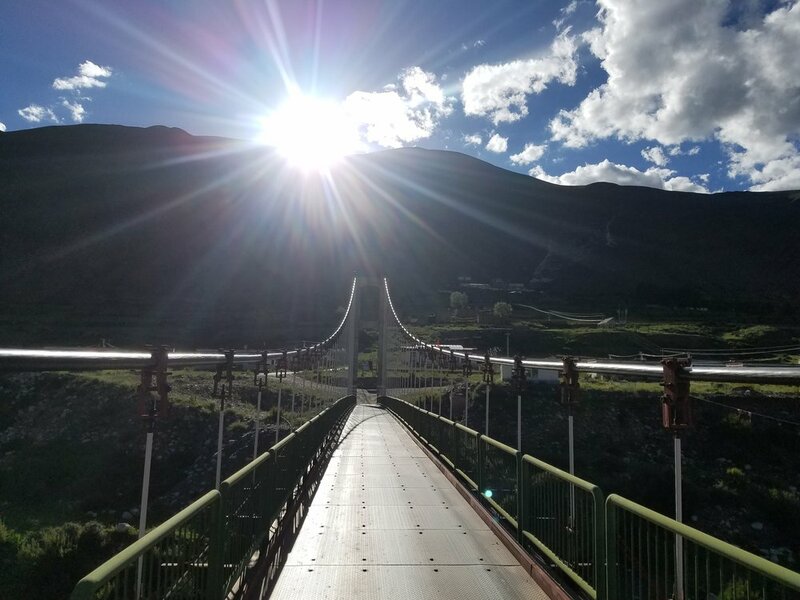 It was our last night in this wild stretch of land that expands all the way to Tibet. Around us mountains jut out to the heavens and I understand why they call this the Rooftop of the World. Kiki grew up on the desert rivers of the southwest. On her first trip down the Colorado River through Grand Canyon she was a small ten-year old with a rag-tag group of boatmen (including her mother). Since then she has had the opportunity to explore rivers all over the world, where they have shown her remote places few have had the opportunity to explore. Kiki teaches yoga and guides full-time in Grand Canyon and on the Middle Fork of the Salmon, instilling people with a passion for the natural world and showing them places where rivers run wild and dark skies still exist. You can generally find her tucked up in some side canyon with a flower in her hat and singing songs about humpback chub on her ukulele.